There have been revolting creatures in Doctor Who before, but just wait till this week's episode. And don't eat your tea while you're watching! The Doctor Who studio on the outskirts of Cardiff is an unprepossessing place. To look at this vast tin hut, you might imagine that it's where people package tins of cat food into boxes. Imagine again. The moment you're through the heavy door and thick, black drapes that keep out natural light, you're confronted by the miniature cathedral that is the Tardis interior, and the looming space becomes something special. Behind the Tardis is the set of space station Sanctuary Base — or, specifically, its feeding quarters and offshoot corridors (entire space stations being unfeasibly large). It's a solid construction, in contrast to certain Doctor Who days of yore: all metallic walkways and moulded perspex windows. Were a giant hand to pick it up and shake it, you sense that bits definitely wouldn't fall off. David Tennant, Billie Piper and the cast are filming writer Matt Jones's two-parter, The Impossible Planet and The Satan Pit—the ones Piper told RT she found the scariest. The story sees the travellers venturing further than ever before. Or, as the Doctor puts it, "We've gone beyond the Tardis's knowledge — not a good move." Director James Strong and crew sit at a monitor, preparing to film the introduction of alien race the Ood. But hold on: "Ood"? "I invented the name," says executive producer Russell T Davies. "It's nice, isn't it? I thought, 'Well, I loved inventing the Slitheen and Raxacoricofallapatorius,' and then I thought, 'Why don't I just call something the Ood?' Ha ha ha ha! I did want them to be a bit odd. "I'm really pleased with them. They were meant to be a slightly cheap monster — in some ways this story isn't about the Ood; it's about the base and the Satan Pit. So you say to [prosthetics ace] Neill Gorton, 'Can you knock us out a monster?' but he can't just knock something cheap out! They're the most brilliantly made monster in the world. I love them!" How would he describe them? "Like they're permanently throwing up; it's really disgusting," says Davies —with relish. 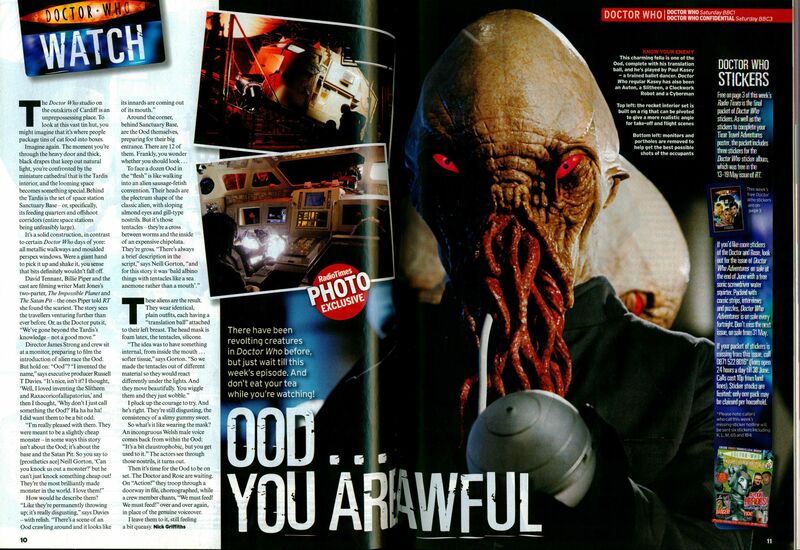 "There's a scene of an Ood crawling around and it looks like its innards are coming out of its mouth." To face a dozen Ood in the "flesh" is like walking into an alien sausage-fetish convention. Their heads are the plectrum shape of the classic alien, with sloping almond eyes and gill-type nostrils. But it's those tentacles — they're a cross between worms and the inside of an expensive chipolata. They're gross. "There's always a brief description in the script," says Neill Gorton, "and for this story it was 'bald albino things with tentacles like a sea anemone rather than a mouth'." These aliens are the result. They wear identical, plain outfits, each having a "translation ball" attached to their left breast. The head mask is foam latex, the tentacles, silicone. "The idea was to have something internal, from inside the mouth .. . softer tissue," says Gorton. "So we made the tentacles out of different material so they would react differently under the lights. And they move beautifully. You wiggle them and they just wobble." I pluck up the courage to try. And he's right. They're still disgusting, the consistency of a slimy gummy sweet. So what's it like wearing the mask? An incongruous Welsh male voice comes back from within the Ood: "It's a bit claustrophobic, but you get used to it." The actors see through those nostrils, it turns out. Then it's time for the Ood to be on set. The Doctor and Rose are waiting. On "Action!" they troop through a doorway in file, choreographed, while a crew member chants, "We must feed! We must feed!" over and over again, in place of the genuine voiceover. I leave them to it, still feeling a bit queasy. Free on page 3 of this week's Radio Times is the final packet of Doctor Who stickers. As well as the stickers to complete your Time Travel Adventures poster, the packet includes three stickers for the Doctor Who sticker album, which was free in the 13-19 May issue of RT. If you'd like more stickers of the Doctor and Rose, look out for the issue of Dictor Who Adventures oil sale at the end of June with a free sonic screwdriver water squirter. Packed with comic strips, Internemos and puzzles, Doctor Who Adventures is on sale every fortnight. Don't Truss t re next issue, on sale from 31 May. If your packet of stickers is missing from this issue, call 0871 522 8016* (lines open 24 hours a day till 3 June. Calls cost 10p from land lines). Sticker stocks are limited; only one rack may he claimed per household. Please note: callers who call this week's missing-sticker hotlire will be sent six stickers including K, L, M, 65 and 184. APA 6th ed. : Griffiths, Nick (2006-06-03). Ood ... you are awful. Radio Times p. 10. MLA 7th ed. : Griffiths, Nick. "Ood ... you are awful." Radio Times [add city] 2006-06-03, 10. Print. Turabian: Griffiths, Nick. "Ood ... you are awful." Radio Times, 2006-06-03, section, 10 edition. This page was last modified on 27 December 2013, at 02:30.